A delicious flattened Mince Patty, entirely vegetarian! Excellent with a hot meal or on a bun. 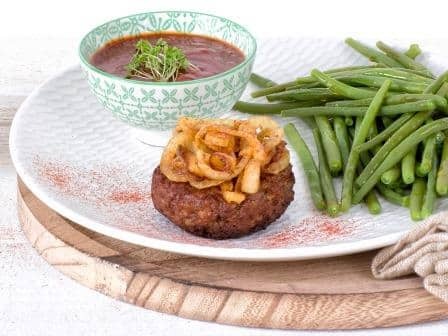 This vegetarian Mince Patty weighs 90 grams. Water, vegetables (onion, garlic), 19% vegetable proteins (soya, wheat gluten), palm oil, starch (potato, wheat, maize), free range egg white, tomato paste, natural flavouring, sunflower oil, dextrose, sugar, spices, colouring agent (plain caramel), mineral (ferrous fumarate), vitamin B12. Produced in a facility that processes peanuts and nuts.